Nan Goldin’s exhibition ‘Scopophilia,’ or “the love of looking”, captures the “desire awoken by images.” The collection combines over 400 of her autobiographical photographs with those taken of works inside the Louvre during off hours. The Louvre, as captured through Goldin’s lens, becomes a house of forbidden desire and skin, anything but stuffy and traditional. Masterpieces reminiscent of museum trips past trigger the nostalgia of an old lover as they are photographed nameless and vulnerable. 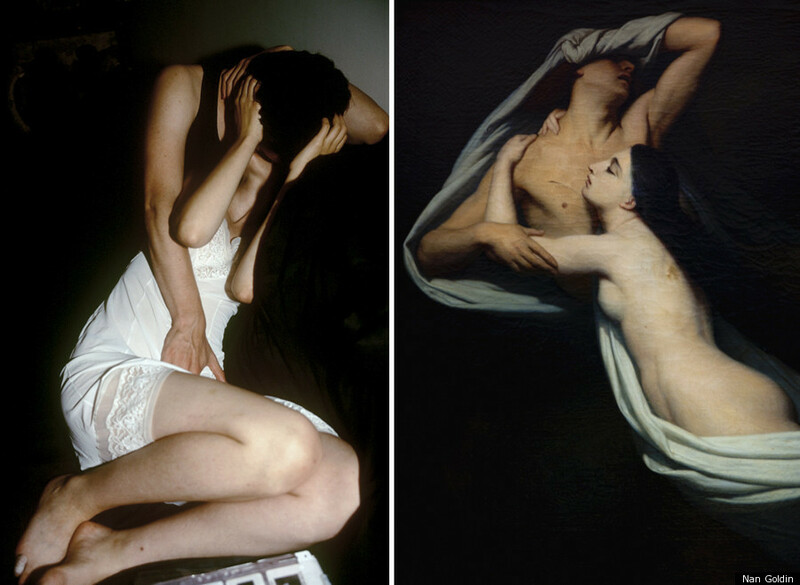 Goldin’s erotically charged aesthetic is contagious, inciting old masterpieces into a sensual fervor by association. Punk-rock pin-ups are juxtaposed with classical, ideal forms, and there is not much difference between the two. In 2011, a Nan Goldin exhibition scheduled for the Oi Futuro Gallery in Rio, one of the most respected contemporary art spaces in the city, was unexpectedly censored. Despite the protests by the artist herself and few other voices the direction of Oi Futuro Gallery has not changed its view on the matter. While this episode occurred long before the political conservative restoration that has taken over the country after 2015, it was already a strong symptom of the moral conservative threats hovering over all domains of Brazilian sexual politics including the art realm. SPW has chosen Goldin as our very last Sexuality&Art post as to express our full repudiation of the art censorship episodes that swept across the country since August 2017. Looking retrospectively, we even dare to suggest that if, in 2012, a larger number of artists, formers of opinions and activists would have raised a strong voice against this censorship, the shadows of moral politics would not be as wide and deep as they are now.